Let's join us for dinner today; with this value set of drinks, soup and main course at RM29.90 only. Promotion is only from 6pm - 10pm! 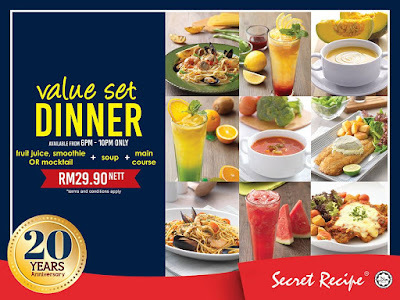 Valid for dine-in only, from 6pm to 10pm. Food selection may vary depending on outlet location. Valid at all outlets in Peninsular Malaysia only, excluding KLIA, PGIA, Subang Skypark, KTIA, PPUM, Tapah R&R, Aeon Mall Taiping and Medini Mall. Not valid with other on-going promotions, privileges, or offers.